By far one of our favorite pork belly recipes… straight from the kitchen of Emeril Lagasse. Place each portion of pork belly in a 1-gallon re-sealable plastic bag. In a medium mixing bowl, combine the orange juice, soy sauce, light brown sugar, lemon juice, lime juice, garlic, ginger, green onions and sambal and use a whisk to blend well. Divide the mixture between the 2 plastic bags and seal them. Place in a baking dish or roasting pan and refrigerate overnight, or for 8 hours. Remove the pork from the refrigerator and allow to sit at room temperature for 1 hour. Place the pork belly in a 9 by 13 inch glass oven proof baking dish, or a small roasting pan and pour the marinade and 3 cups of the chicken stock over and around the pork belly. Place in the oven and roast for 1 hour. Turn the pork belly over and roast for another 1 1/2 hours. Remove from the oven and place on a counter top, or cooling rack to cool. Allow the pork to cool in the cooking liquid and, once cooled, about 1 to 1 1/2 hours, cover with plastic wrap and refrigerate for at least 6 hours or up to overnight. Remove the pork from the refrigerator and uncover. Carefully remove any congealed fat that rests on top of the cooking liquid. Using a sharp knife, score the fat layer of the pork in a cross hatch pattern. Add the remaining cup of chicken stock to the pan and place in the oven. 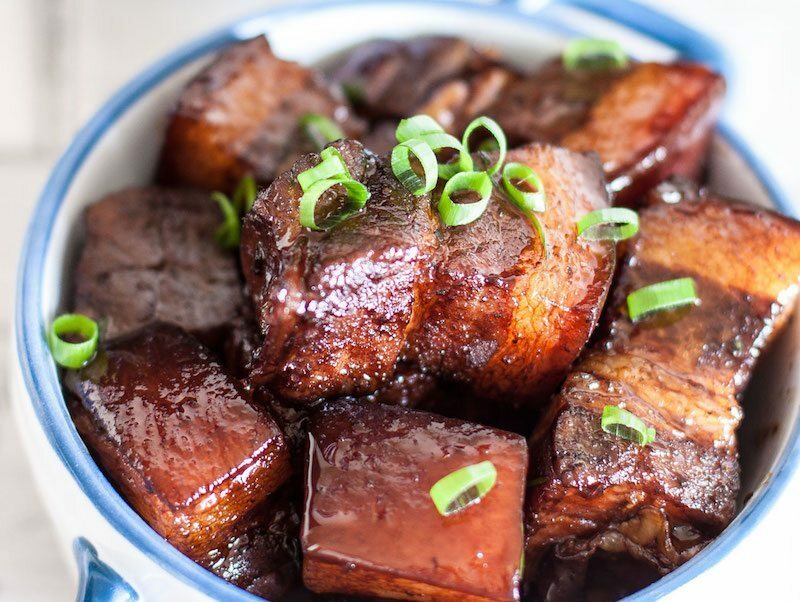 Cook the pork belly until slightly caramelized on top and warmed through, 20 to 25 minutes. Remove from the oven and slice into portions. Enjoy as an appetizer or incorporate into your main entree! [optional serving suggestion]: Place the frisee in a large bowl and toss with the rice wine vinegar. Season lightly with salt and pepper. To serve, place a portion of the pork on a warmed entree plate with 2 ounces of the frisee. Pour some of the sauce over the pork and serve immediately.